FB series, integration of metallic indices and hands on classical design dial, gives to the watch a new depth of trendiness by making it to a suitable occasion. Case Material :Stainless steel ;Case color :Rose Gold ;Mirror material :European standard crystal sapphire glass ;Band Material :Quality cowhide. Luminous hands, change the strap as your will. 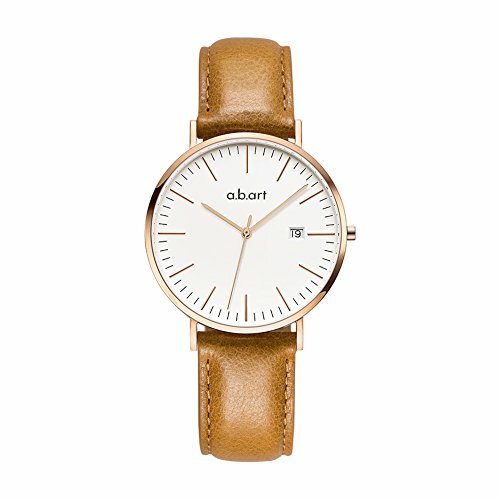 Every a.b.art watch is a timepiece with high quality, and designed with Ronda Quartz Movement 715 Swiss Parts. Sapphire crystal window makes a.b.art watch more durable and hard to resist scratch. 36 mm Stainless Steel Case; Date Indicator; Croco Alexander Calf /Lido (Oily Cowhide) Strap--Pin Buckle; Mesh bracelet steel Strap--Buckle Closure; Crystal Sapphire Grown Glass Window; Quartz Movement with Analog Display; Water resistant to 30m.